In a world of cookie cutter compact cars, the Fiat 500L has no problem standing out. Modern, European-inspired styling may be the 500L's defining characteristic, but there is a lot more to love beneath the surface. 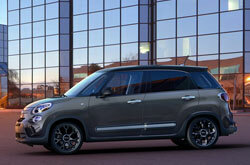 From a spacious cabin to an energetic turbocharged engine, the 500L has a lot to offer Scottsdale drivers. Learn more about this charming compact wagon by continuing our 2017 Fiat 500L review below. 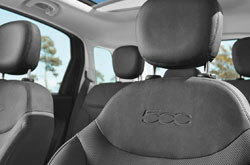 The first thing you'll notice about the Fiat 500L is its smart use of space. There's plenty of wiggle room in the cabin, plus an extra 22.4 cubic feet behind the second row for cargo. This model year, the 2017 500L simplifies its lineup to three trims: Pop, Trekking and Lounge. The entry-level 500L Pop is equipped with remote keyless entry, power accessories, a leather-wrapped tilt-and-telescoping wheel, six-way adjustable front seats and a sliding rear row. The cabin is remarkably tech-savvy as well, featuring a 5-inch touchscreen with voice controls plus standard Bluetooth phone connectivity and two USB ports. For the fashion-forward drivers out there, the 500L Trekking upgrades its exterior appearance with unique body panels, foglights and 17-inch wheels. 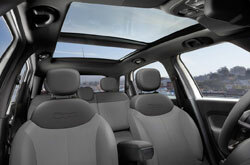 On the inside, the compact car receives heated front seats, leather upholstery and a Beats Audio sound system. The 500L Lounge builds on those good looks with chrome accents, and a painted finish on the wheels. 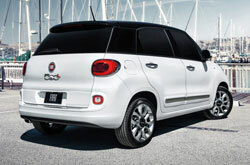 Looking for even more chic features to add to your 500L? 2017 Fiat 500L reviews recommend checking out the stand alone options, which include unique color combinations, matte black wheels and a sunroof. The 2017 Fiat 500L in Scottsdale cruises around with ease, thanks to its turbocharged 1.4-liter four-cylinder engine, which makes a healthy 160 horsepower and 184 pound-feet of torque. A six-speed automatic transmission is now the standard offering. The 500L offers a smooth and nimble ride quality whether you are speeding through the city or inching along bumpy country roads. 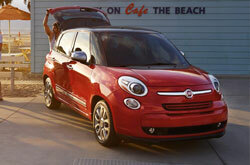 Plus, each drive is made even more enjoyable by the 500L's respectable fuel economy ratings. EPA estimates for the compact wagon come in at 25 mpg combined. With active headrests, daytime running lights, seven standard airbags, hill hold assist and stability control, the 2017 Fiat 500L in Scottsdale is well-equipped to keep passengers safe and sound on the road. Additional safety features such as rear parking sensors and a rearview camera are also available through the Popular Equipment package. 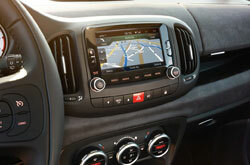 Want to Read More Info About the Fiat 500L? Have the 2017 Chevy Sonic, Honda Fit and the Ford Fiesta commanded your attention? Then you should also look at buying a 2017 Fiat 500L in the Phoenix area. It could be a clear-cut match for you, due to its deviceful cabin amenities and fun-loving personality. 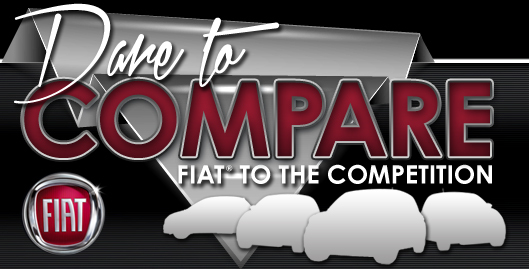 Use our review and try out the comparison tool to see if the 2017 Fiat 500L is ideal for you. Also view finance offers while you're here! As a local Fiat 500L dealer, we're the spot to find attractive offers on both new and Certified Pre-Owned car models. When making your eventual buying decision, we hope our 2017 Fiat 500L review offers the info you need to make an authoritative purchase. Our dealership offers a vast stockpile of impressive Fiat 500L models at Fiat of Scottsdale in Scottsdale, AZ. Visit us to take one for a spin. For those anxious to see it right now, we've included a video walk-around that spotlights its interior features.